One of my favorite topics that I studied in any class this year was dimensions. I found all the theories incredibly fascinating and, even though the videos gave me headaches, I loved every minute of it. We studied 11 dimensions, with us living in the fourth dimension, but my two favorite dimensions were the 7th and 8th dimensions. In the 7th dimension, there is a different universe for the infinite amount of outcomes for the past, present or future. For example, in one universe of the 7th dimension, Michael Jackson might still alive. In another universe of the 7th dimension, World War II might never have happened. In the 8th dimension, there is also an infinite amount of possibilities, except they are based on different physics. For example, in our universe, the speed of light is the universal speed limit (assuming the tachyon is only theoretical), but in a universe in the 8th dimension, the speed of light could be one of the slowest moving waves. 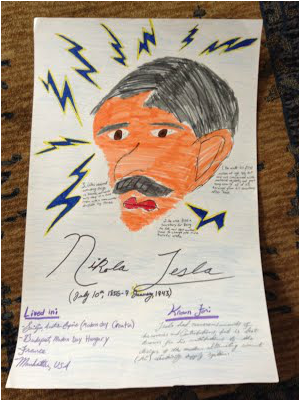 The main project that we did in correlation with the dimensions was create caricature poster boards of famous physicists. First, we had to draw a caricature of the Physicists that took up 70% of the poster. Then we had to add 3 interesting/random facts, date of birth and death, full name, country of origin, and what they are famous for. I chose to do two to get extra credit. 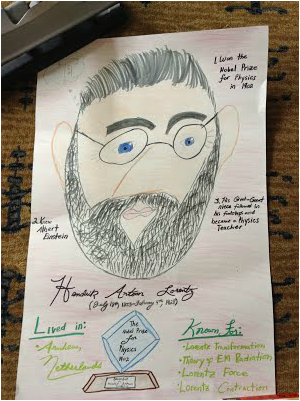 My two physicists were Nikola Tesla and Hendrik Lorentz, Mrs. Quinny's Nobel Prize winning great great grandfather. For the dimensions, I am very proud of the fact that I was able to stay focused and not get too lost when we took notes or watched a video. If I could revise something, it would be the amount of notes that I took while watching the videos, because I only remember some of the things that they talked about. Looking back on it, I wish I remembered more because it was all so fascinating. 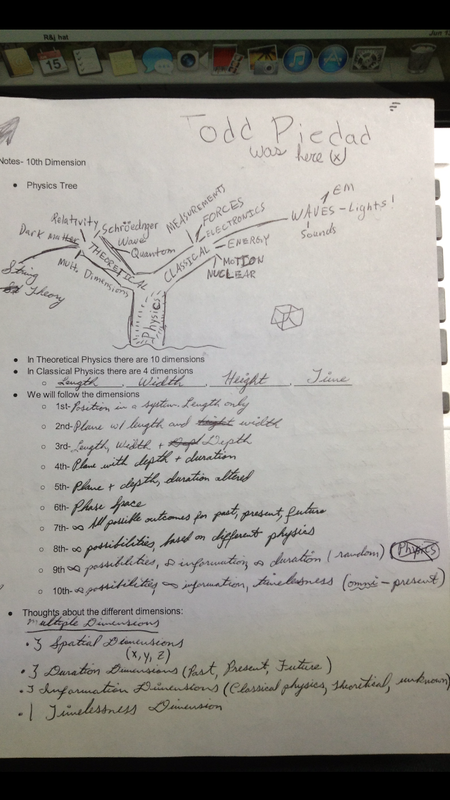 The things that I am most proud of in the Physics Caricatures are the interesting/random facts that I was able to find about both Lorentz and Tesla. If there were something I could change or revise, it would be not coloring Tesla in with orange. That was a big mistake. During the making of the caricature, the Habit of the Heart and Mind that I used the most was Perseverance because 70% of this assignment had to do with drawing, and I am a terrible artist. I also used a lot of Evidence because basically everything that was not art was research.